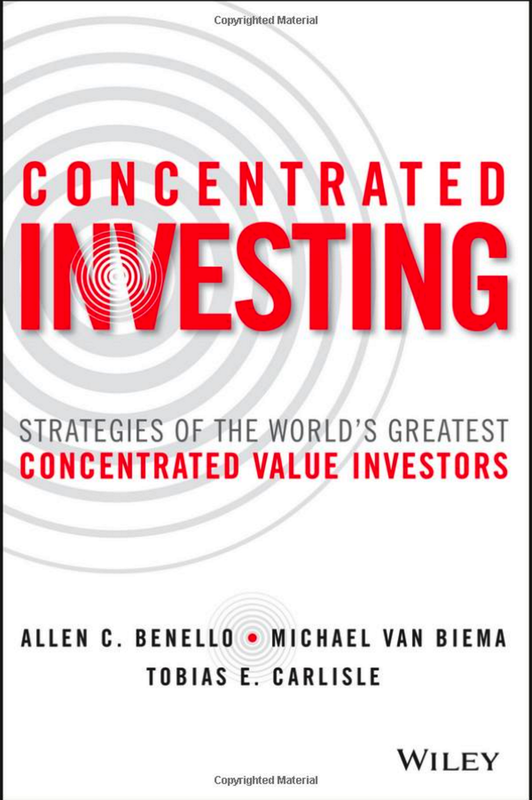 Starting in the mid-1980s, researchers began investigating simple value strategies. That’s not to say value investing was invented at that time. We fear the ghosts of Benjamin Graham and David Dodd too much to ever imply that. This was when researchers began formal, modern academic studies of these ideas. What they found was that Graham and Dodd had been on to something. Stocks with lower price multiples tended to produce higher average returns than stocks with higher price multiples. As a result, the simplest diversified value strategies seemed to work. Importantly, they worked after accounting for the effects of CAPM (that is, for the same beta, cheaper stocks still seemed to have higher expected returns than more expensive stocks). The statistical evidence was strong and clearly rejected the joint hypothesis of market efficiency and CAPM. Above is a graph of the cumulative returns to something called HML (a creation of Fama and French’s). HML stands for “high minus low.” It’s a trading strategy that goes long a diversified portfolio of cheap U.S. stocks (as measured by their high book-to-price ratios) and goes short a portfolio of expensive U.S. stocks (measured by their low book-to-price ratios). The work of Fama and French shows that cheap stocks tend to outperform expensive stocks and therefore that HML produces positive returns over time (again, completely unexplained by the venerable CAPM). The graph above shows this over about 85 years. If you notice the circled part, that’s when we started our careers. Standing at that time (before the big dip you see rather prominently), we found both the intuition and the 65 years of data behind this strategy pretty convincing. Obviously, it wasn’t perfect, but if you were a long-term investor, here was a simple strategy that produced positive average returns that weren’t correlated to the stock market. Who wouldn’t want some of this in their portfolio? Fortunately for us, the first few years of our live experience with HML’s performance were decent, and that helped us establish a nice track record managing both Goldman’s proprietary capital, which we began with, and the capital of some of our early outside investors. This start also laid the groundwork for us to team up with a fellow Goldman colleague, David Kabiller, and set up our firm, AQR Capital Management. As fate would have it, we launched our first AQR fund in August 1998. You may remember that as an uneventful little month containing the Russian debt crisis, a huge stock market drop and the beginning of the rapid end of hedge fund firm Long-Term Capital Management. It turned out that those really weren’t problems for us (that month we did fine; we truly were fully hedged long-short, which saved our bacon), but when this scary episode was over, the tech bubble began to inflate. We were long cheap stocks and short expensive stocks, right in front of the worst period for value strategies since the Great Depression. Imagine a brand-new business getting that kind of result right from the get-go. 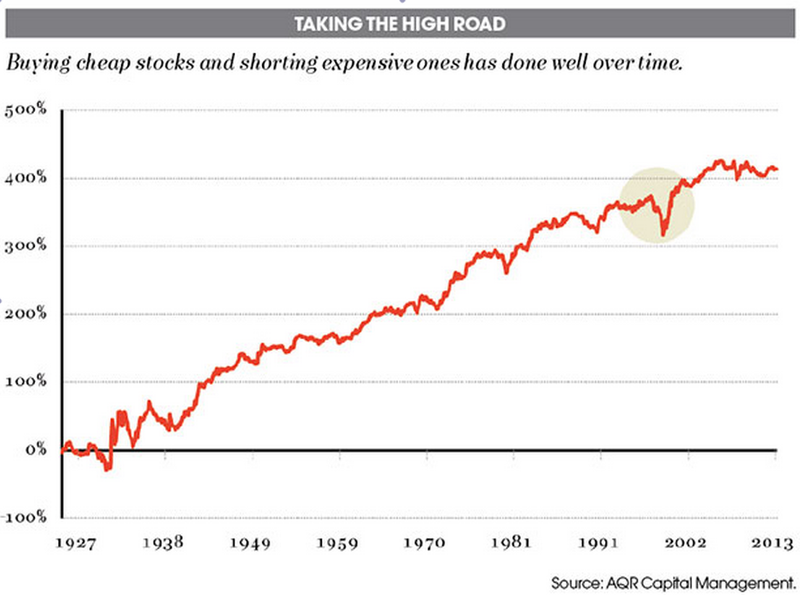 Not long cheap stocks alone, which simply languished, but long cheap and short expensive! We remember a lot of long-only value managers whining at the time that they weren’t making money while all the crazy stocks soared. They didn’t know how easy they had it. At the nadir of our performance, a typical comment from our clients after hearing our case was something along the lines of “I hear what you guys are saying, and I agree: These prices seem crazy. But you guys have to understand, I report to a board, and if this keeps going on, it doesn’t matter what I think, I’m going to have to fire you.” Fortunately for us, value strategies turned around, but few know the limits of arbitrage like we do (there are some who are probably tied with us). We usually end up thinking the market is more efficient than do Shiller and most practitioners — especially, active stock pickers, whose livelihoods depend on a strong belief in inefficiency. As novelist Upton Sinclair, presumably not a fan of efficient markets, said, “It is difficult to get a man to understand something, when his salary depends upon his not understanding it!” However, we also likely think the market is less efficient than does Fama. 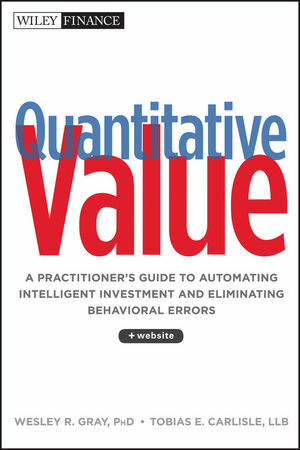 After backtesting countless “value” and fundamental strategies for our book Quantitative Value I found myself in the same boat. There exist some strategies that, over the long term, lead to a consistent, small margin over market, but fewer work than most believe, and our own efforts to cherry pick the model inevitably lead to underperformance. Click here to read The Great Divide over Market Efficiency and here if you’d like to read more on Quantitative Value, or connect with me on LinkedIn. I would love to see the actual annual investment returnS achieved b.y these two theorists. The enclosed graph is just not clear enough.